Waterworlds contributions in special issue of "Danish Journal of Geography"
Special issue of Danish Journal of Geography 2012:, Vol. 112(2). 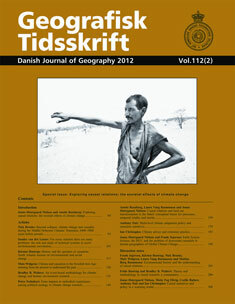 Edited by Jonas Østergaard Nielsen, post doc. at Department of Anthropology, Waterworlds, and Anette Reenberg, professor in Geography at University of Copenhagen. This special issue presents a series of articles and short discussion notes that are the collective outcome of an international seminar entitled Exploring causal relations: the societal effects of climate change hosted by Waterworlds in January 2012. A general observation from comparisons across and within the empirical studies constituting Waterworlds has been that identifying global climate impacts and connections is difficult. Numerous and often conflicting entanglements, perforations, and assemblages of different perspectives (cultural, scientific, political, and economic), scales (spatial and temporal), and environmental concerns (land degradation, pollution, and climate change) constitute a huge challenge at all scales of inquiry. Climate is, for example, often – if not always – only one of a range of factors influencing human decisions. The journal can be accessed online here.